It's hard to say whether or not Jesus would have included vegans on his To-Save List, since I really doubt vegans existed in the year 33 AD. Beggars can't be choosers, after all, and I think pretty much everyone was a beggar back then. Except for, you know, Herod et al. 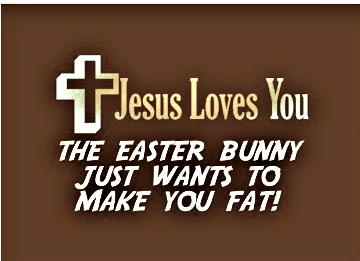 But Easter, like Christmas, has become so much more than what, religiously speaking, it "should" be. And, unfortunately for me, the whole commercial aspect of this holiday is not too vegan-friendly. When I was little, my family and I used to make hard-boiled eggs the night before Easter, then draw designs all over them with crayons and dip them in cheap dye. Sometimes my sister Katie would get really artsy and make her eggs striped with different colors, but mine usually ended up unevenly tinted and with fingerprints all over them. I never really looked forward to eating the eggs on Easter morning, because the dye had usually leaked through to the egg whites and made them look weird. But no eggs for me this year. And no milk chocolate bunnies, either! I spent most of the afternoon at my friend Erin's apartment, where I made delicious vegan pancakes with 100% pure maple syrup for everyone. I had to say no to Erin's homemade lavender ice cream, but I had a whole plate of her breakfast potatoes with peppers and onions. The reason I ate so much at Erin's is because I was starving. I had not planned well for the morning. One of my jobs is to sing at the Lutheran church where my friend Adam is music director, and this morning I had signed on to perform at both the 8am and the 10:30am services. There were two reasons for that decision: I am desperate for money and I like making up harmonies to Christian rock songs. Adam had told me that there would be a huge potluck brunch at the church all morning, and that I could help myself to any of it during the break between services. I heard the word "brunch" and stopped listening. I just love brunch. So after the first service (during which - and I am not making this up - the pastor terrified the congregation with a synopsis of Hitchcock's "Final Escape" and then told us that we were all buried alive until Jesus came and dug us up), I skipped over to the church's multipurpose room to get my hands on some brunch. The room was filled with all kinds of dishes that the members of the church had brought to share. There were all different varieties of muffins and moist-looking breads, quiches, sausages, pudding, and bacon. But I couldn't eat any of it. The one dish that I could have eaten, roasted potatoes, had been covered with scrambled eggs. It was as if the parishioner who made it had prepared the potatoes and, just before heading out the door, thought to himself, "Oh wait - a vegan might eat some of this!" then promptly dumped a pan of scrambled eggs on top of it. Certainly not for the first time in a church, I felt ostracized. But I didn't want to bring it up to anyone else because - again, not for the first time in a church - I felt guilty. These people were really enjoying their Easter brunch, and I didn't want to complain. I found a sad-looking bucket of fruit and put some in my mouth so I could at least avoid keeling over during the second service. The worst part was that the guy who plays the drums in the band asked me to bring him back a plate of food. So I heaped everything I wanted to be eating onto a plate and delivered it to him, trying not to look down at it. So does Jesus love vegans? Who knows, probably. Should I have brought my own vegan dish to the parish potluck instead of trying to be such a mooch? Yes, definitely. Because I am not a beggar, I'm a chooser. And choosers can't be complainers.